I was reminded when I was making this sauce with red bell peppers, poblano and jalapeno peppers as a topping for pork recently what a huge leap of faith it was the first time I made it. As you know if you’ve read this blog for any length of time, I have a huge, big, very bad aversion to green bell peppers. Just cringed even typing that sentence (I’m not kidding!). Although I discovered years ago that this aversion to bell peppers did not carry over to hot peppers (whew!) I kept my distance from yellow and red bell peppers just by association; knowing they are really the same thing. I’ve often wondered..is it nature or nurture? Neither my sis, my kids or my ex like them either! Then one day, in the most inauspicious way, things changed. The gaggle of girlfriends that called ourselves ‘The Marthas’ decided to have a brunch; one of my friends had a sister that was going to be in town so we made a big production of it and I remember the dish that Madeline made that was filled with onion, potatoes, cheese, butter and a whole slew of red and yellow peppers. So much I loved but still, I just knew I would not like it but I resigned myself to put on a happy face and not moan about it either. My aversion is taste, it’s not allergies so I just suffer in silence when the occasional bell pepper moment appears and no one is the wiser (but now you all know!!). No one was more shocked than I was when I loved that dish. Don’t get me wrong; I’ll probably never move to cutting raw strips for salads, but cooked and seasoned with onions and potatoes…it was simply divine. My next shopping trip to the market I acted on my more adventurous spirit and bought a couple of red peppers determined to do something with them. Enter this sauce. The pork is not the star of this dish, it’s the sauce…just a terrific blend of flavors, the milder red pepper with some of that heat I’ve grown to love combined with honey, lime and cilantro? Perfect! If you have the same aversion to cilantro that I do to green peppers, just omit it. I like it but the sauce is great without cilantro too. Sometimes I’ll put a crust on a pork tenderloin before baking it but this last time I simply rubbed it with salt and pepper before baking it for 50 minutes; so simple and yet so elevated with some simple ingredients. Know what else is perfect? We love tacos with shredded pork, coleslaw and some of this sauce. More? Pour some over a block of cream cheese and serve with crackers. 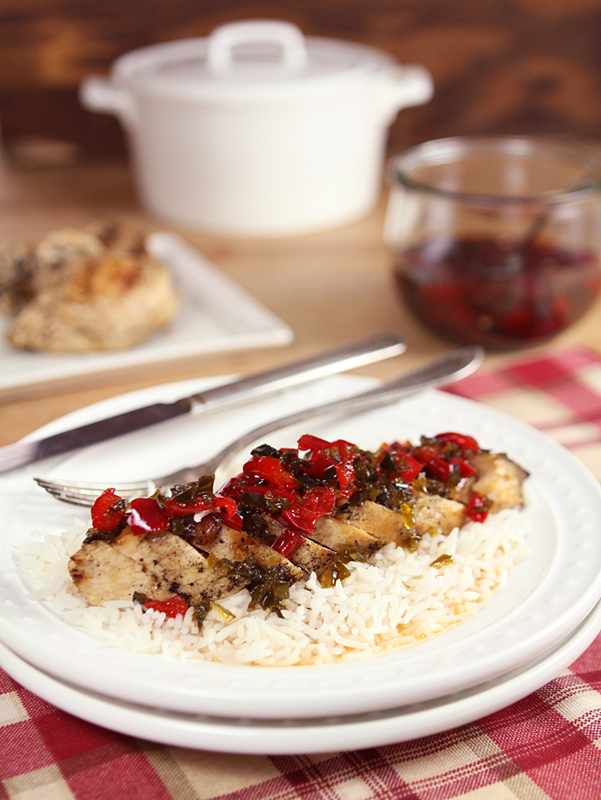 Great over chicken too; heck I’ve had nights when I just ate rice with some sauce. Can you tell how MUCH I love this? Whole Bunches!! A sweet/hot sauce that is wonderful on pork or chicken. Simmer all peppers, honey, lime juice, and salt in a 1-quart heavy saucepan over moderate heat, stirring occasionally, until sauce is slightly thickened, about 30 minutes. Cool sauce to warm or room temperature, then stir in cilantro just before serving. Sauce (without cilantro) may be made 2 days ahead and chilled, covered. Heat over low heat until warm and stir in cilantro. I've been trying to use my slow cooker more to make life a bit easier and it did for this sauce. I put everything into it in the morning, cooked on low heat all day and by dinner time the sauce was ready. I omit the cilantro should I sub in parsley or not? I would just not add it at all; I omitted it last week because I worried that someone in a crowd might not like it and everyone loved it just the same! Thanks, Barb for the parsley info. have you ever canned this using vinegar instead of lime juice? I have not tried that Brenda; I can just enough to never be called an expert so I would be afraid to try something that I didn’t have someone’s else recipe for. I’m guessing the higher acidity of the vinegar might be enough but I would have no idea. I would probably freeze it before I would can it since all the veggies are cooked. Let me know if you try it! Yum! That sauce sounds great in the mouth. I know my husband will love it considering all the peppers (haha), spicy and not. I’ll try it with less honey and see how it goes. Sure…and let me know too OK? The slow cooker is a wonder cooker! I am sure that really brings out all of these neat flavors. I love that the old show cooker that has been relegated to the back of every cooks under the counter cabinet is in the midst of a revival…they are so worth the attention! I love your group name the “Marthas”, that made me smile as one of my husbands nicknames for me is Martha! I love the sound of this, we have a slew of peppers growing, so this recipe is great timing and sounds just my thing! You would be most welcome at any of our gatherings then! Thanks too about the sweet sentiment about Lauren. She is doing so well; we feel blessed beyond belief. I am soooo happy that you discovered that you like red peppers. Otherwise, I would not be making such a delicious recipe! It is so hard reading food blogs at night. I would eat this with a spoon! We are definitely on the same page…I’ve come a long way and this is proof positive! Oh Barb, I love every ingredient in here, and to have them all together sounds just plain delicious. I love that you served it over cream cheese, too…what a terrific appetizer to indulge in. What a beautiful dish! I’m with you on the green peppers. Keep them away! When my brother returned home from the army in the late 60’s he REALLY hated them. He said that the army cooks served them all the time. Can you imagine? I love red, yellow and orange peppers. It’s just those green ones! 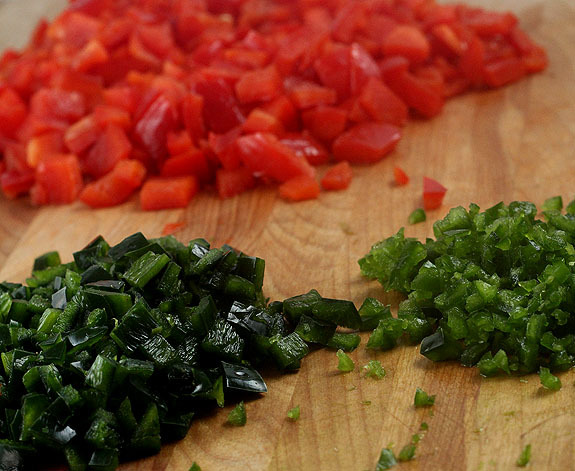 I love how I find compadres in my hate for green peppers…welcome to the club! 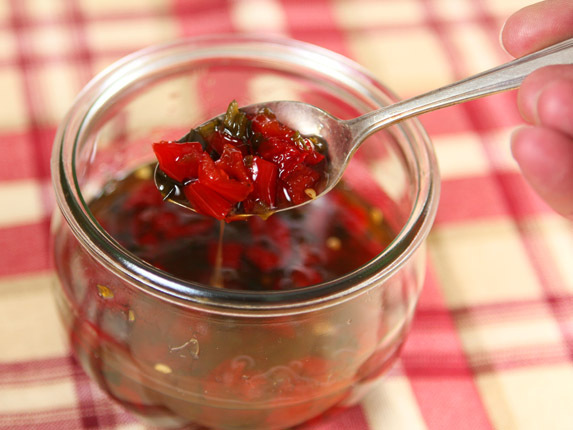 This reminds me of my favorite jalapeno jelly recipe which is is also great with brie. Beautiful colors in there! Yes, this would be great with brie too! It’s sort of perfect; a a great complement to the cheese and pretty too. oh, thanks so much for this recipe. i can’t wait to make it!!! I hope you enjoy it…it’s easy and delish! This looks like it’s going to be our family’s favorite salsa. Love the combination of spicy and sweet and the great versatility of the recipe! That’s what I love too; when I have some around I find all sorts of uses for it. That sauce looks gorgeous on top of that pork! This does look like a fabulous sauce! I never liked green peppers as a child and I still am not fond of them except in the right dishes. I think the groceries back then only sold green. Then I went to Israel where they had never heard of a green pepper. They have only red-but maybe it has changed since then. In any case I found I love red peppers so that is what I generally use until someone shows me a recipe like this! I went too many years not touching the red or yellow…never really knowing that the difference was more than color. Besides the taste…I think the red makes for a prettier dish too; so it’s a win win for me. Beautiful colors and I can tell just from reading the recipe that this is going to be fabulous!! I am always looking for sauces that I can use in multiple ways so this is definitely going on the “to make soon” list!!! I bet this would be great on fish too! Fantastic sauce! What a versatile sauce and a great find. I love what we “do” for family. I have an aversion to olives; however, Giuliano’s first dish for me was olives and chicken. I ate it then and I still do today. Sometimes a great preparation is all we need. I find that peeling the backs of the peppers will take the bitterness away.